Questions keep rolling in over a succession of dodgy loans involving former KZN premier and his wife. 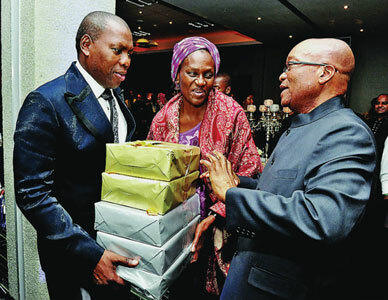 FORMER KZN premier Dr Zweli Mkhize signed a lucrative lease agreement with a KZN businessman who had given Mkhize’s wife Dr May Mashego two R1-million interest-free loans. Evidence leaked to Noseweek shows how businessman and property developer Protus Sokhela secured a three-year R10.9m property lease with the provincial Treasury (when Zweli Mkhize was KZN MEC for finance)after having made two payments of exactly R1m each to a company of which his wife May is the sole director. Mkhize became KZN ANC chairperson in mid-2008, around the time the deal was being concluded, and became the province’s premier in 2009. A medical doctor by profession, Mkhize has held on to some of the most senior positions in the ANC both provincially and nationally. As recently as December 2017 he was in the race for the ANC presidency. The lease, signed in 2008 is a matter of public record. KZN Department of Public Works spokesman Mbulelo Baloyi said it had covered a period of three years, with effect from 1 August 2009. “The total rental paid was R10,966,124.94. The commencement rental was R75/m² and R350 per day.” Although Baloyi said that the lease was signed on 23 December 2008, further evidence shows this date was merely administrative; the deal was concluded months earlier. Three months later, on 14 June 2007, Sirela purchased a multi-storey block known as the Nomalanga Building, 212 Langalibalele Street, Pietermaritzburg for R10m, from the now-deceased John Basil Mitropoulos. Exactly seven months later on 15 January 2008 a second “loan”, also of R1m, and was made to Essential Equity CC, with the same terms as the first. Technically this would mean May was in for repayments of R100,000-a-month for the next 14 months, providing she made profits, of course. Both loan agreements were drawn up by the law firm Ngcobo Poyo & Diedricks Inc. Mkhize’s lawyer at the time was Thoba Poyo-Dlwati, one of the partners in the law firm. She is now a sitting judge in the KwaZulu-Natal High Court. Only Ngcobo remains at the firm. Ngcobo denied any knowledge of the loan, merely stating “I am not aware [of the loan]” but in a later email he said he’d been unable to locate anything, therefore “cannot assist with your inquiries”. On 3 July 2008, Sirela registered the property with the Deeds Office and just two months later on 5 September 2008 a government tender bulletin was released. It confirmed that the KZN Public Works department had acquired the services of “Sirela Trading” for providing “accommodation” in Pietermaritzburg for the “Department of Treasury”. The provincial treasury has remained in the building ever since and has invested several million rand in refurbishments and “reconfiguration” of the interior at various times since 2009 – as publicly available budget votes have shown. Sirela Trading still owns the building and between 2015 and 2016 the company bonded the property to Standard Bank for a R30m loan and a further R10m loan. Essential Equity is the vehicle used by the Mkhizes to run their farm just outside Pietermaritzburg – used among others for buying Nguni cattle. Sirela Trading is used for any number of projects, from property ownership to agriculture and waste management. At the ANC’s December conference Mkhize withdrew his nomination for deputy president; to become no.1 on the party’s National Executive Committee. In February he became embroiled in the parliamentary inquiry into governance failures at Eskom, essentially a “state capture” probe by Parliament. Former Passenger Rail Agency of South Africa (Prasa) chief executive Lucky Montana told the committee that Mkhize, using his former position of ANC Treasurer General, tried to muscle a 10% commission for the ANC from a contract worth nearly half-a-billion rand. Mkhize has since stated he wants to challenge the Montana bribe claim. In the interim, the EFF has laid a criminal charge of corruption at the Hillbrow SAPS against Zweli Mkhize based on Montana’s testimony. Previous loan scandals that the Mkhizes have weathered include a R13m loan made to May by the KZN government-owned Ithala Bank while Mkhize was the provincial Treasury MEC and a de facto head of the bank. However he says he did declare the loans to the legislature. Ithala was often called a piggy bank for the elite, who were offered soft loans with little need for security. It had a habit of making loans to its own senior management and leading political figures and their families which were later written off. In 2010, the Sunday Times reported that R86m in loans made to senior management was in arrears. Ironically, it was Mkhize’s cabinet, some of whom, along with their families, had been awarded soft loans from the same bank that banned loans to politicians and their relations. Questions were sent to Sokhela and the Mkhizes. Numerous telephone calls were made and SMSes sent. 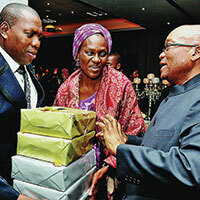 Repeated attempts were made to contact them personally and through a spokesman for Zweli Mkhize, Tahera Mather. Mather initially said she could not assist, as the questions sent to her related to Mhize’s wife and not Zweli. The questions were repurposed for Zweli, however no response was forthcoming at the time of going to print. Among the questions was whether they believe a conflict-of-interest existed and whether the KZN legislature was informed of the loans. Protus Sokhela should not be confused with Patrick Sokhela, his brother, and an equally successful businessman. Patrick is the current owner of low-ranked football team AmaZulu FC. Protus Sokhela’s business interests stretch from printing to waste management, engineering, hygiene services, farming, property and, more recently, within the military-complex fold. He is an active director in 79 different companies. Recently he co-developed the Life Hilton Private Hospital just outside Pietermaritzburg. In 2014 Sokhela, as chairman of Elisa Holdings, became the South African partner for CAE – a Canadian-owned company that provides training in “civil aviation, defence and security, and healthcare markets”. The two companies signed a deal with South African arms manufacturer Denel to establish a National Training and Simulation Centre (SANTSC) that will offer aviation pilot technical training as well as emergency and disaster management training for the SANDF, commercial airlines and security companies.